President Trump trolled soon-to-be House Speaker Nancy Pelosi Thursday night after the House passed an interim bill 217-185 providing $5 billion for border wall funding. It was just last week that Pelosi told President Trump that the House could not pass border wall funding. It was impossible. Gateway Pundit reporter Cassandra Fairbanks caught Pelosi dancing the night away in a DC bar Wednesday as she thought she successfully blocked border wall funding — it looks like Pelosi counted her chickens before they hatched. Thursday night the Republican House put Pelosi in her place with Meadows and Jordan leading the way. The President celebrated the revamped House bill and trolled Pelosi. TRUMP: Thank you to our GREAT Republican Members of Congress for your VOTE to fund Border Security and the Wall. The final numbers were 217-185 and many have said that the enthusiasm was greater than they have ever seen before. So proud of you all. Now on to the Senate! 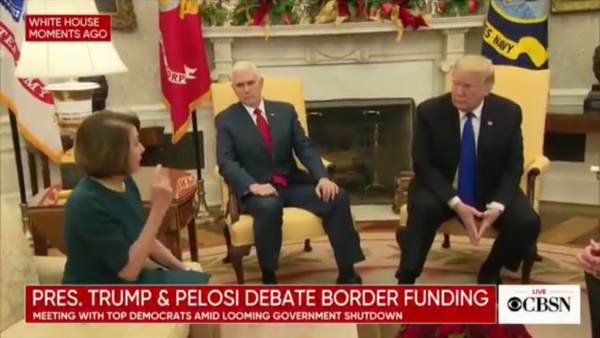 TRUMP: Soon to be Speaker Nancy Pelosi said, last week live from the Oval Office, that the Republicans didn’t have the votes for Border Security. Today the House Republicans voted and won, 217-185. Nancy does not have to apologize. All I want is GREAT BORDER SECURITY! The bill heads to the Senate where according to Fox News, only 51 votes are needed to pass the revamped interim spending bill. Mitch McConnell can go nuclear to get this bill passed. If the spending bill doesn’t pass the Senate by Saturday, the State Department has already been directed to prepare for a shutdown, reported FOX News. Previous Previous post: CNN’s Blitzer Claims Democrats Support Border Security. Stephen Miller Humiliates Him.